This is a webinar for aspiring NIHR Fellowship award holders ahead of the launch of round 10 of the programme later in the year. The webinar is aimed at clinicians, allied health professionals and health researchers who wish to learn more about personal training awards. The webinar will be presented by Nicola Melody, Senior Programme Manager at NIHR TCC and Jill Carlton, Research Fellow in the Health Economics and Decision Science section of ScHARR (School of Health and Related Research) and Fellowships advisor for NIHR Yorkshire and Humber RDS. As this is a live webinar, attendees will be able to send questions in to the speakers and we will try to answer as many as possible during the webinar. We encourage you to send your question in advance, please for BU, email Alice Brown: browna@bournemouth.ac.uk with the subject: ‘Fellowship Programme webinar question’. Are you and your team working on the cutting-edge science that is delivering the NHS of the future? Have you created an award winning health device or introduced a new innovation that benefits patients and radically changes diagnosis or management? NHS England are calling on the healthcare science community to put forward nominations for this year’s annual Healthcare Science Awards. Healthcare science Rising Stars; (Life Sciences, Physiological, Medical Physics & Clinical Engineering, Bioinformatics) •Innovation in Scientific Services; •Improving Quality and Efficiency through Workforce Transformation; •STEM Engagement; •Healthcare Science Provider Organisation; and •Healthcare Science Patient and Public Participation. The Centre of Postgraduate Medical Research and Education are hosting their Eleventh Annual Symposium on Tuesday 14 October 2014. 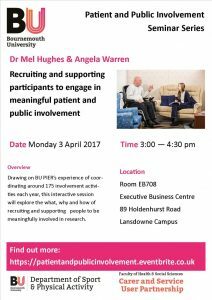 The event will focus on developments and activities around impact in healthcare research and education. It will explore impact from the perspectives of the public, the research funder, the university, the provider, the student and the medical educator. Jonathan Grant, Director, Kings Policy Institute. This symposium is suitable for primary and secondary doctors, allied healthcare professionals, academics and anyone with an interest in medical research and education. Interested staff from across BU are invited and very welcome. You can register on Eventbrite here. For more information please contact Audrey Dixon.